APIA INTERNATIONAL SYDNEY, Jan. 15, 2016 – Svetlana Kuznetsova has been around for a very long time, with 2004 the first year she served notice on the tennis world. She lost early in New Zealand, losing in the second round, and she was not considered the favorite at Sydney. But she got her feet wet, took out Sabine Lisicki and Sara Errani, and on Friday, she had to knock out two competitions to win the title, No. 2 Simone Halep and Monica Puig. On a bizarre day on Thursday, it was hot and sunny in the morning, but then the whipping rain came and pretty much wiped out play. Halep was on serve 5-4 in the first set. In the other semis, Puig was up 4-0 over Belinda Bencic. On Friday, the rain was coming in and out, so the women came on court ASAP. Bencic said she was ill and she was throwing up, so she was retired down 6-0. But even though Halep has been a little bit afraid due to her sore Achilles Heel, she wanted to run around as fast as she could. The Romanian fought very hard, but the Russian won the match 7-6 (5), 4-6, 6-3. Kuznetsova has so much variety. She twisted, she sliced, she spun and she blasted inside the lines. A few hours later, she and Puig went on court and before the youngest competitor new it, she was gone, 6-0, 6-2. Kuznetsova was in the zone. These days, she is so much smarter than she used to be. Back in 2004, few people knew who Kuznetsova was outside of Russia, but once people saw her, they could see how powerful she was and how much spin she put on the ball. At Roland Garros, she was running around, slicing, chopping, and rolling his thunderous forehand. In the fourth round, she held a few match points against the No. 5 Anastasia Myskina, but she could not push her way. Her now very good friend Myskina won the tournament, and it looked like Kuznetsova was down in the dumps, but after a few weeks later, the then 19-year-old picked up where she left off. At the US Open, she was a thoroughbred, streaking past Mary Pierce, Nadia Petrova, Lindsay Davenport and Elena Dementieva to win the title. She had risen quickly. However, in the next year, she began to slump because there was too much pressure, too soon. Too many people were talking about her and she didn’t like it. It took her four years to rise up again. In 2008, she reached five finals, including Sydney. She wasn’t totally there yet, but she was much more consistent. In 2009, she took off, winning Roland Garros. How good was she in Paris? She knocked off Aga Radwanska, Serena Williams (7-5 in the third set), Sam Stosur (another dramatic three sets) and Dinara Safina to snare the crown. She knew exactly what she wanted to do. But the reality is that since then, she has been pretty darn good, but overall, she has not been great. She has won 15 singles title and 16 doubles title, which is just fine, but she has been so unpredictable. Look at the 30-year-old in 2015: in the first four months, she didn’t win three matches in a row until May, when reached the final in Madrid, stunning Lucie Safarova and Maria Sharapova. She looked terrific, moving fast, mixing it up, and smacking her balls deep and skipping around. In the final, her legs were gone and she couldn’t move against Petra Kvitova. But it looked like she was going to charge again. Kuznetsova has a load of experience, but she can drop off fast. That she did, for no reason at all. She lost early at Wimbledon and at the US Open. Kuznetsova didn’t go deep either in Asia. She was getting a little tired and ready for the season to end. But the tournament directors asked her to come to Moscow. She hemmed and hawed. She decided to go and all of a sudden, she was happy. Who knows why? She wasn’t glum as she had a huge smile on her face when she won the event. 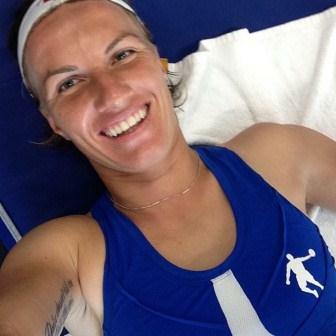 Kuznetsova says that she played too many events last year. She wants to be calmer and not be playing every week. We will see. But, when she on, she can be lethal and she will battle until the last ball. Remember the 2011 Australian Open? In the third round against Francesca Schiavone, she survived 6-4 1-6 16-14 after holding six match points and finally winning after four hours, 44 minutes. She just wouldn’t give up. Kuznetsova has yet to win the Australian Open, but she has reached the quarters three times. She has a very tough draw. She has to face with the former No. 4 Daniela Hantuchova in the first round. She might have to face Bencic in the third round, and maybe have to go up against her friend, Maria Sharapova, in the fourth round. If she shocks Sharapova, then she might face Serena in the quarters. Wow, now that would be difficult, but whomever she plays, she just likes to strike the ball. “I never dream of winning one. I never thought winning one,” she said. “It just happens behind hard work, effort, and just having pleasure playing tennis. To me. I’m not saying it’s good way for somebody else. If I have this opportunity and I can take it, I would love to. I would be extremely happy. If not, my life not going to end on it. But still, I love the game. I’m enjoying what I’m doing. It’s great I can still win titles.